The Nashville Predators found Christmas all over again on New Years Eve when they defeated the Columbus Blue Jackets 2-1 in overtime at the Nationwide Arena in what was described as a party atmosphere. David Legwand scored the game winning goal 28 seconds into overtime. The Preds trailed 1-0 for most of the game until Andreas Thuresson scored his first NHL goal to tie the game midway through the third period. Joel Ward had the sole assist on both goals. The lone Columbus goal was scored by Raffi Torrez early in the first period when Dan Ellis overplayed a shot and was well out of position when Torrez had an easy shot at an open net. Both Dan Ellis and Mathieu Garon were outstanding in net. Ellis stopped 31 shots while Garon turned away 27. The game got off to a quick start with a block of over four and a half minutes of sustained back and fourth action starting after an offside at :21. At 6:02 Columbus stuck first when Dan Ellis was out of position in front of the blue ice giving Raffi Torrez a shot at an open goal to give the Jackets an early 1-0 lead. The period had minimal stoppages in play and passed very quickly. The Blue Jackets out shot the Predators 12-10 in the first period. Uncharacteristically, there were no penalties on either team. The second period started with the same speedy play. After 13:53 of back and forth skating, Columbus was whistled for the first penalty of the game when newcomer Milan Jurcina was called for tripping. The Predators had two shots on the man advantage, both of which were good scoring chances but Garon came up big for the Jackets. At 16:25, David Legwand was called for holding giving the seventh ranked Blue Jacket power play its first appearance of the evening. Columbus had two shots but did not convert. The second period ended as it started with Columbus hanging on to a 1-0 lead. The Jackets out shot the Preds 11-9 for the second stanza. The Preds and Jackets each battled hard with Columbus out hitting Nashville 16-13 through two periods. The Predators did a better job of controlling the play during the last half of the period. The third period opened with the same intense tempo of play. At 2:30 Arnott caught a post and then Hamhuis and Thuresson both had excellent scoring chances but Garon continued to stand on his head in the Columbus net. Jered Boll was called for elbowing at 6:30 when he tried to nail Francis Bouillon in the corner. It could have been an injury causing play but Bouillon was able to avert the worst of the blow but did get an elbow in the process. The Preds only managed one shot on the man advantage. After being patient and not forcing the play the Preds finally got a break. At 12:39 in the third, David Legwand brought the puck down the ice and Joel Ward picked up the puck behind the Jacket net and passed it to a wide open Andreas Thuresson who put it past Garon to tie the game 1-1. A minute later Rick Nash celebrated prematurely on a shot that went through Dan Ellis' five-hole and ricocheted off the post. A video review confirmed that it was not a goal. With 4:08 remaining, the Preds almost scored again on a broken stick shot by Ryan Suter that floated to the net. Garon had trouble handling it and Arnott came close to putting the rebound into the net. Both goalies had major scares in the last two minutes of play. Andreas Thuresson almost scored his second goal of the game when he caught a post and the puck slowly floated across the blue ice before being swept clear. Regulation play ended with the score tied 1-1. Both teams had nine shots in the third period. Twenty eight seconds into the overtime, there was intense battling for the puck behind the Columbus net when Joel Ward freed the puck and fed it to a waiting David Legwand in front of the net who buried it the game winner. Both teams played well enough to win and you could tell early that it was going to be a real back breaker for the team that lost. Both teams battled hard and neither were able to take advantage of the other team's miscues. The Predators showed exceptional patience as they played Barry Trotz hockey and did not deviate from their game plan. They battled for pucks, went to the hard areas, and sacrificed their bodies for the good of the team. Trotz always says that if you do those things long enough you will be rewarded and that's exactly what happened for the Predators. Andreas Thuresson scored his first NHL goal and played 23 shifts for 14:03 of playing time, his career high. He took advantage of the injury to Marty Erat and took his game to a new level and almost got a second goal with less that two minutes in the game. Alexander Sulzer filled in well for Kevin Klein playing 17 shifts for 13:35 of ice time. Mike Santorelli only played nine shifts on the fourth line but did fire three pucks toward the net. Other than the play that led to the Columbus goal, Dan Ellis played a near perfect game in net. Ellis looked a bit uncomfortable early but settled down and received the first star of the game honors. Both goalies played well but Ellis received more help on defense in front of the net which contributed to his stellar play. When the Preds did make mistakes Ellis came up big to save several Columbus scoring chances. The Preds returned home after the game and should be back in Nashville before the midnight hour. The Preds open a four game home stand against Anaheim on Saturday when they will play the Ducks on consecutive Saturdays with Calgary and Carolina squeezed in between. The Nashville Predators (23-14-3) will close out 2009 playing the Blue Jackets (15-18-8) in Columbus at the Nationwide Center in what is guaranteed to be a party atmosphere. Just for the record, the Predators are 46-32-8 with tonight's game remaining during calendar year 2009. They were 23-18-5 during the post New Years portion of last year's schedule. The Predators will be without Kevin Klein and Marty Erat due to injuries suffered in Tuesday's game with the Blues. The latest word is that Klein may return on Saturday and Erat should return within a week or so from a strained knee. There has been no recent word on the return of Jordin Tootoo or Jerred Smithson. Columbus will have a new look with the trade earlier this week that sent Jason Chimera to Washington in exchange for the Cap's captain, Chris Clark and Milan Jurcina. While losing a scorer the Jackets picked up some needed defensive help and veteran leadership. Dan Ellis (8-7-1, 2.91, .904) will start for the Predators while Mathieu Garon (4-5-2, 2.89, .902) will be in goal for the Blue Jackets. Career-wise, Dan Ellis is 4-1-1 against Columbus while Garon is 2-6-1 against the Preds. This will be the fourth meeting between the two clubs this season and the second in Columbus. In the Predators last visit to Columbus on December 14, Steve Sullivan had his seventh career hat trick leading the Preds to a 5-3 win. With injuries to four key players, the youngsters that will step in to the line-up need to play with hunger like they don't want to return to Milwaukee. Nick Spalling and Andreas Thuresson who have been with the Preds for several games, are now joined by Alexander Sulzer and Mike Santorelli, putting rookies in key positions in the Predators line-up. These players need to assume the positions that they have been given and elevate their game to the next level. Expect to see several combinations as Barry Trotz will juggle his lines based on who he feels is best able to contribute. Yesterday was a red-letter day for four current Predators (Marty Erat, Shea Weber, Marcel Goc and Alexander Sulzer) who were named to the respective national Olympic teams. This is in addition to Patric Hornqvist being named to Sweden's team previously. The Olympics are still six weeks into the future so all the focus needs to return to the game at hand. Being named to a national team does nothing to minimize the importance of tonight's game. All the Olympic talk needs to be left to the media and fans. The Jackets had six players named so it may be a contest of which group can refocus on the present most effectively. On the flip side, Pekka Rinne suffered a major disappointment for not being added to Finland's roster. From what I was told last night, he was aware of this before the last game and is committed to proving the selection committee wrong by being the best he can be for the rest of the season. There will be a festive atmosphere at the game tonight and the crowd will be ready to get rowdy in support of the Blue Jackets. The Preds need to come out and set the stage for the evening by controlling the tempo early and trying to score first to take the crowd out of game as much as possible. As always when the Preds and Jackets meet, it will be a chippy game. The Predators need to play with discipline and not get drawn into needless penalties as the Blue Jackets have the seventh best power play in the league (21.2%) and the Pred's PK has been horrible (29th, 75.7) and have given up man advantage goals in twelve straight games. The Preds return home immediately after the game and should be back in Nashville before the new year begins. The Preds open a four game home stand against Anaheim on Saturday when they will play the Ducks on consecutive Saturdays with Calgary and Carolina squeezed in between. Today's action in the World Junior Championship features the game that everyone has been waiting for, the showdown between USA and Canada, with the winner getting a bye in the medal round. Both teams are 3-0 and have not been challenged so it will interesting to see who is best prepared to raise their game to the next level. The game is set for 7 p.m. CST on the NHL Network. In the other grouping, undefeated Sweden will play Finland, with the winner most likely getting the bye onto the semifinals. That game is at 1 p.m. CST. Another important game will be at 3 p.m. CST when Switzerland plays Slovakia, with the winner moving into the medal round and loser going to relegation. Pred Prospect, Roman Josi of Switzerland was Puck Daddy's number one star of the day at the tournament as he led Switzerland to a 7-5 win over Latvia. He was also named to their Olympic team earlier in the day. The Predators will meet the Blue Jackets in the last game of the year tonight at Nationwide Arena in Columbus at 6 p.m. which will be televised on FS TN. We will provide our game preview with our Keys to the Game later today. Barry Trotz and Ken Hitchcock were in the same room together for a Columbus Coach's Show on @971thefan on Wednesday afternoon. I was able to call in and I asked Barry about Pekka's reaction to not making the Finnish Olympic team. Barry said that Pekka knew that he wasn't being chosen on Tuesday. He basically said that Pekka was disappointed but challenged to prove he is the best Finnish goalie in the NHL. We had two stories about the Pred's Olympic selections (1, 2) and the story about Mike Santorelli and Alexander Sulzer being recalled from Milwaukee. John Glennon has the story about Shea Weber making Team Canada, the injury situation and a game at a glance for tonight's game at Columbus. He also had stories about Barry Trotz's reaction to the injuries along with an update on the Erat and Klein conditions. Forechecker found this story that Mark from The View from 111 did for a web site called Stadium Journey. It is an interesting look at the home of the Preds. Dirk also had more updates from Wednesday than we can list at OnTheForecheck so check them out. Mark also has a neat story about Barry Trotz. I heard about this at the time but didn't give it the proper consideration that Mark does. Trotzy is one of a kind and someone that we should be proud to call our coach. No matter whether you agree of disagree with his moves on the ice, his character can never be questioned. AJ has a nice piece at Pull My (Fang)Finger about the Pred's Season on the Brink (Part 1). Section 303 has the story about Pekka getting the shaft. They also has stories about all the Olympic picks. The Olympian has a story about Ryan Suters Olympic Legacy. Cool Tweet from teammate Dan Ellis before Weber's selection yesterday "@dellis39: Fingers crossed for my boy WEBS...I want to see him t up bombs for team Canada!!!!!!" From Tuesday is a bunch of pics from the Blues-Preds game from Ashley Glatz of inside hockey. From @TheViewfrom111: Congratulations to Tim Darling Communications Dir. for the Preds on the birth of his son Hayden Daniel this morning. 8 lbs, 2 oz & 19". Short Shifts has the US team for the AHL All-star game that has no Admirals which leaved Cal O'Reilly as the lone representative to either squad. On Wednesday, for the first time, there was serious public discussion about moving the Winter Classic to Saturday if it appeared that rainy conditions would prevail on New Year's Day. The forecast was in flux so it could possibly be game day before a change is made. Here is the link to the Winter Classic hub on NHL.com that should have the latest offical information as the situation developes. The NHL Network will have coverage of both team's practices today on the outdoor ring beginning at 10 a.m. CST and running to 2:30. It will be rerun once completed so those of us who have to work today can also see it. Versus Network will have New Year's Eve hockey coverage beginning at 10 p.m. CST in a 90 minute show that will preview the Winter Classic and celebrate the New Year with entertainment from the House Of Blues. Tim Rosenthal and Jake Duhaime have video from the ice at the Winter Classic on Wednesday when the Media got to skate on the Fenway Park rink..
Matt at The View from My Seats has all the Olympic rosters that have been announced. Justin Bourne has an article about parents putting too much pressure on kids playing hockey at The Hockey News. Tim Rosenthal has a good review of a book I'd like to read, "Gold, A Celebration of the 1980 US Olympic Team." The DC Examiner is insulted that Team Canada took Shea Weber over Mike Green. The death of another sports section (Washington Times) is chronicled by the rival paper. Being in print media is a scary proposition these days. For BlackBerry users this is an interesting app if you plan on having an auto accident. As the claim manager for an insurance company, I see folks on a daily basis that have no clue what to do after a wreck. Maybe we should buy our insureds BlackBerrys with their app preloaded. Totally off topic but I sure our northern audience would love this hillbilly stereotype of a guy beating a deer to death with a stick. Anywhere else PETA would lynch the guy and here he's treated as some type of good Samaritan. The official release from the Predators is interesting. Dirk, the Forechecker, posted an article that showed San Jose with the most Olympic picks with seven so far. The graph also shows the Predators with five. The Predators release also includes Alexander Radulov as being "within the organization" which along with Pred prospect Roman Josi (Switzerland) would bring the total to seven. If Ryan Suter is named to the Team USA as expected, that would make eight total. Nashville, Tenn. (December 30, 2009) – Several rosters for the 2010 Olympic Winter Games were revealed today, and a number of Nashville Predator players were given the nod to play for their respective countries. Shea Weber (Canada), Martin Erat (Czech Republic), Alexander Sulzer (Germany) and Marcel Goc (Germany) were all named to their respective nations’ Olympic rosters today, joining Patric Hornqvist as Predators who will be heading to Vancouver in February. The United States will be the last nation to announce its roster (Jan. 1), and Nashville defenseman Ryan Suter is a strong candidate to boost the number to six. Weber was named to the team after tying a career high in assists with three in Tuesday’s win at St. Louis (first attained Oct. 18, 2008 vs. Columbus, 1g-3a). The Sicamous, B.C., native entered Wednesday night’s play tied for 12th among NHL defensemen in goals (6), tied for 18th in points (21) and third among blueliners in shots (101). An NHL defensemen-best five of his goals have come on the road. Erat will be making his second consecutive Olympic appearance after scoring the game-winning goal in the Bronze Medal Game at the 2006 Games in Torino. Erat has points in 12 of Nashville’s 14 games this month, amassing 18 points (10g-8a). His goal on Sunday at Chicago tied Jason Arnott’s goal total from February 2009 for the most goals scored by a Predator in a single month, and is tied with Florida’s Stephen Weiss and Montreal’s Andrei Kostitsyn for first in the League. His point total in December is also tied for sixth-best in the NHL. This is Goc’s third time to be named to the German Olympic roster, and second time to play in the Games – having scored one goal in five games for the Germans at the 2006 Games in Torino. With his eighth goal of the season on Tuesday at St. Louis (in addition to an assist), Goc matched a career high set in his 2005-06 rookie season with San Jose (81 games) in just 38 games. The Calw native has 10 points (4g-6a) in his last seven games, and 16 points in 2009-10 (8g-8a), which is the second-highest total of his career, trailing only the 22 points he recorded in 2005-06 (8g-14a). The first-year Predator has 13 points (6g-7a) in his last 14 outings after posting three points (2g-1a) in his first 24 contests of 2009-10. All 16 of Goc’s points have come at even strength, while 13 of his 16 points have come on the road. He has points in nine of his last 10 road games (7g-5a). Recalled on Wednesday after a one-game assignment in Milwaukee, Sulzer will also be playing in his second Olympics for the Germans – he notched one assist in five games at the Torino Games. The first Predator named to an Olympic squad was Hornqvist when defending gold medalist Sweden named him to its roster on Sunday. Hornqvist scored for the second consecutive game on Tuesday, giving him 10 points (7g-3a) in the last eight games. His seven goals in the second-half of December (since Dec. 14) are tied with Chicago’s Patrick Kane for tops in the League. The Sollentuna native is tied for third among Swedish NHLers in goals (13), ranks 12th among his countrymen in points (21), and is fourth among Tre Kronor forwards in plus/minus rating (+9). His four game-winning goals is tied for sixth in the entire League, and 19 (11g-8a) of Hornqvist’s 21 points (13g-8a) this season have come at even strength. Others within the organization named to their respective countries’ Olympic Teams include Roman Josi (Switzerland) – who will be one of just two players (along with teammate Luca Sbisa) to play in both the 2010 World Junior Championships and 2010 Olympics – and Alexander Radulov (Russia). The Predators wrap up a three-game Central Division road trip tomorrow night at 6 p.m. when they take on the Columbus Blue Jackets (FOX Sports Tennessee (HD), WGFX-104.5 The Zone). The team will then return to Nashville to play four straight games to start 2010, hosting Anaheim twice (Jan. 2 & 9), Calgary (Jan. 5) and Carolina (Jan. 7). Tickets to these games, and all other regular season contests, are now on sale and can be purchased by logging onto nashvillepredators.com. Tickets are also available by calling (615) 770-PUCK and at all Ticketmaster locations. With injuries to Kevin Klein and Marty Erat in Tuesday's game against the St. Louis Blues, the Nashville Predators recalled Mike Santorelli and Alexander Sulzer from Milwaukee to fill the void for Thursday's game in Columbus against the Blue Jackets. According to John Glennon at Inside Predators, Klein may be able to return on Saturday but Erat is being returned to Nashville for further evaluation and may be a more serious injury. Nashville, Tenn. (December 30, 2009) – Nashville Predators President of Hockey Operations/General Manager David Poile announced today that the club has recalled forward Mike Santorelli and defenseman Alexander Sulzer (al-ehx-AN-duhr SUHLT-suhr) from Milwaukee (AHL). Santorelli, 23 (12/14/85), has suited up for 21 NHL contests this season, posting three points (2g-1a). The Vancouver, B.C., native scored his first NHL goal on Oct. 28 at Minnesota, and collected his first career assist two games later on Oct. 31 vs. Dallas. He is also 3-for-3 in shootouts for the Predators this season. This is Santorelli’s third stint with the Predators – he also 17 points (9g-8a) in 15 games for the Admirals. Sulzer, 25 (5/30/84), has notched one assist in 10 games with the Predators in 2009-10. He returns to the club after a two-game assignment to Milwaukee that saw him post three points (1g-2a). In 12 games at the AHL level this season, he has 13 points (2g-11a). Sulzer – the first German ever to suit up for the Predators – was also named to his country’s 2010 Olympic team on Wednesday. With Christmas Day all over again has now been completed with the highly anticipated announcement of Team Canada that held the hockey world spellbound while the Canadians slowly announced the team. It appears that he Predators will have seven eventual representatives for their national teams. Ryan Suter is a virtual shoe in when Team USA is announced during the Winter Classic. In one of the biggest snubs of all, Pekka Rinne was not named to Team Finland which is surprising after leading Finland at the World Championships last May and having another great season this year. Today will be a big day for several Predator players as they should be hearing from their National Olympic committees that they will be traveling to Vancouver to represent their countries at the Olympics in February. Patric Hornqvist has already been named to Team Sweden on Monday. The next closest person to being a lock is Shea Weber for Team Canada. Dan Hamhuis attended their summer camp but is not in the running at this point. The Team Canada announcement will be featured in an hour long special on the NHL Network this morning at 11 a.m. CST. The next list of near locks for today's announcements would include Marty Erat (Czech Republic), Pekka Rinne (Finland), and Marcel Goc (Germany). All are virtually assured of a berth after strong seasons so far in the NHL. Update: Forechecker reports that Pekka Rinne will not be on Team Finland as they went with Antero Niittimaki instead. You really have to wonder how this will affect Pekka's psyche. Update: Marty Erat, despite his injury last night, was named to the Czech team. Update @diamondhockey: Goc and Sulzer on Germany's Olympic team, Josi for Swiss, and Erat for Czechs. Rinne left off Finland's squad. Update: Shea Weber named to Team Canada! Roman Josi, who is playing for Switzerland in the World Juniors this week also has a good chance to be picked for the national team also. Other prospects with potential to make their teams include Alexander Sulzer and Robert Dietrich from Germany. On Friday, during the Winter Classic, Team USA will be announced and it is expected that Ryan Suter will be named as one of the key defensemen. All this speculation leads to the point that Predator fans should have plenty to watch during this year's Olympics as six teams should be represented with familiar faces. For those who missed our update late yesterday, here is the audio of may appearance with Mick Kern on NHL Home Ice's The War Room on Tuesday morning. Here is our story from last night. With 49 points the Preds moved back into 5th place in the Western Conference. John Glennon has the game story at the Tennessean. In his notes column, Barry Trotz discusses, dirty hits, injuries and possible recalls. John has more at Inside Predators including postgame thoughts and Patric Hornqvist getting an extra goal credited from Sunday's game in Chicago. David Boclair has his piece at The City Paper. 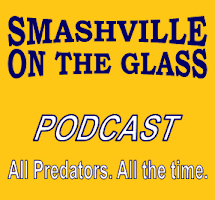 In the Predator blog world Forechecker, Rachel at What the Puck, Mark at The View From 111, and See Puck City have their stories from the Preds-Blues game. For the St Louis side of the story visit the St. Louis Post Dispatch. Jim Diamond has a look at his picks to make Olympic teams. Short Shifts has the game story of the Admirals 7-1 win over Rockford on Tuesday. Cal O'Reilly was selected to play in the AHL All-Star game for the Canadian squad. Be careful where you get your voucher. Up to $450,000 of Predator and Memphis Grizzlies vouchers for tickets were stolen recently. At the World Junior tournament, Team USA fared well in a 12-1 stomping of Latvia on Tuesday. It wasn't as many goals as in Canada's 16-0 win but was equally as impressive. Canada handled Sovakia 8-2 in a game where Ryan Ellis had a goal and two assists. Russia lost to Sweden 4-1 and the Czech Republic beat Austria 7-1. Today, there are no games on the NHL Network but Finland will play Austria and Switzerland will play Latvia. All eyes will be focused on Thursday's USA-Canada meeting. The Predators site has a running update of prospects playing in the tournament. The Hockey Zen Episode #34 discusses the World Juniors and POTG gets a shout-out. For those without the NHL Network FastHockey is streaming all Team USA games (legally) over the internet. The NHL Network will air "Pond Hockey" today at 5:30 CST which is a great movie that we reviewed last year about the World Pond Hockey Championships in Minnnesota that are held annually. It is a muxt see. Tom Reed at the Columbus Dispatch has the human side of Jason Chimera leaving Columbus where he had become a part of the community. Mile High Hockey analyzes the Western Conference playoff race. View from My Seats has their third podcast available for a listen. The Nashville Predators held off a late attack by the St. Louis Blues to win a 4-3 game at the Scottrade Center in St. Louis on Tuesday night. The win broke a three game losing steak for the Preds and added to the Blues' home woes, dropping their home record to 6-13-2. The Predators got goals from Marcel Goc, Joel Ward, Patric Hornqvist, and J. P. Dumont, who also had an assist. Shea Weber picked up three assists for the evening. The Blues received their scoring from Carlo Colaiacavo, Alexander Steen, and Andy McDonald. Pekka Rinne saved 24 of 27 shots and picked up his 15th win of the season as he awaits word on whether he will be named to the Finnish Olympic team during the wee hours of the morning on Wednesday. Chris Mason took his second career loss to his old team as he stopped 26 of 30 Predator shots. The win may be costly for the Predators as Martin Erat and Kevin Klein both left the game during the first period with injuries and did not return. There was no word as to the seriousness of the injuries. The game got off to an uneven start for the Predators. During the Blues second shift Kevin Klein was upended and the Preds appeared to be waiting for a penalty call while the play went the other way and ended with an early goal at 1:29 by Carlo Colaiacavo. Klein was forced to leave the game and did not return due to the "upper body injury". The Predators answered quickly at 5:04 when Marcel Goc scored his career high eight goal with assists from J. P. Dumont and Ryan Suter to tie the game 1-1. The Predators went on their first power play of the evening at 10:38 on a slashing call against Roman Polak. They were unable to convert, but five seconds after the penalty expired Patric Hornqvist redirected a Martin Erat shot into the net to give the Predators a 2-1 lead. With 3:01 left in the period, Marty Erat had to leave the game with a "lower body injury" suffered on a knee to knee hit where no penalty was accessed. The first period ended with a 2-1 Preds lead. For the period the Predators dominated the possession and out shot the Blues 15-6. The second period started in a nightmarish fashion for the Blues. At 1:21 T. J. Oshie was called for boarding . At 2:00, while battling for the puck behind the Predator net, Barret Jackman caught J. P. Dumont with a high stick to the face from which resulted in a 4:00 double minor. At 3:06 Mike Weaver was called for delay of game when he flipped the puck over the glass from the defensive zone. After gallant efforts from St. Louis to kill the consecutive 5 on 3 Predator power plays, Joel Ward finally picked up a loose puck in front of the Blues net and scored making it a 3-1 game at 4:09 in the second. The Blues went on the power play at 11:07 when Steve Sullivan was called for slashing. The Preds successfully killed the penalty. The Predators returned to the man advantage at 15:25 when Keith Tkachuk slew-footed Ryan Jones and was called for tripping. The Preds were unable to score on their power play. With 39 seconds left in the second period, Shea Weber was called for cross checking as he battled for the puck behind the Predator net. The Preds held the Blues scoreless for the rest of the period. The Predators again led in in shots for the period by a 11-9 margin. The third period started with 1:21 left on the St. Louis carry-over man advantage. The Blues managed a shot but no goals on the remainder of their power play. The Predators were back on the penalty kill at 3:04 when Francis Bouillon was called for hooking when the tried to break up an Andy McDonald break-away. The Predators held firm again. At 5:16, J. P. Dumont picked up a puck at the Predator blue line and took it the length of the ice past a hounding Darryl Sydor and deeked Chris Mason as he placed it in the net through Mason's five hole. It was an amazing play for Dumont and the goal ended up being the game winner. The Predator lead was 4-1 after scoring four unanswered goals. David Backes put the Preds back on the man advantage at 10:03. Before the Preds could mount a scoring effort, things went the other way at 10:41 when their power play was cut short by a Steve Sullivan interference call. After the four on four expired, Andy McDonald scored on the last shot of a four shot flurry when he picked up a rebound behind Rinne for the tap in goal to bring the Blues within a goal at 4-3. With 6:30 left Pekka Rinne took things into his own hands on a high risk play, skating past the face off circle to knock the puck away from an onrushing Blues attack. He was upended but returned to his net without facing a shot. The Preds went back on the power play at 13:40 when Keith Tkachuk was called for interference but the Preds could not take advantage of the man advantage. The remainder of the game involved constant back and forth skating until the Blues pulled Chris Mason with a minute remaining to bring on an extra attacker. The Blues were unable to score but did out shoot the Preds 12-4 during the final period. After a three game losing streak, where the first two games were marked by half-hearted effort and inconsistent play, the Barry Trotz brand of Predator hockey returned. The Predators played their most complete game since the Calgary game before the Christmas holidays. While the Preds continued to struggle on the penalty kill, giving up a goal for the 14th time in their last 15 games, they did manage to break through with a power play goal for the first time since December 17. The primary positive from the game was the way the team continued to battle despite having a short bench due to the injuries to Klein and Erat early in the game. The Predators lost the services of Kevin Klein and Marty Erat on dangerous plays where no penalty was called. In the second period during a scrum around the net, Patric Hornqvist received a couple of punches to the back of the head while the official stood watching with his swallowed whistle. A penalty was finally accessed against Keith Tkachuk on a near knee on knee hit to Ryan Jones. The Predators are already missing Jordin Tootoo and Jerred Smithson for at least a couple more weeks and will be hard pressed to continue filling voids from within the organization if the injuries to Klein and Erat are of the long term variety. The Predators played an extremely disciplined game in spite of a hard hitting affair and several plays where no calls were made that could have been distracting to the Predator effort. The Blues' first goal was partially caused by the Predators waiting for a call that did not happen when Kevin Klein went down on a questionable hit. The Blues and Preds pounded each other on the boards with St. Louis out hitting the Predators 21-15 for the game. The Predators did not respond to several taunting type plays and took only four penalties to the Blues' seven. The Predators will travel to Columbus for a New Year's Eve match with the Blue Jackets before returning home to play the Ducks on Saturday in the first game of a four game home stand. Out of the blue, I received an invitation to appear on NHL Home Ice, XM204's The War Room with Mick Kern and Peter Berce. Mick is one of my favorites on Home Ice so it was quite a privilege to appear on behalf of our web site. It was my first "official" big time, national radio appearance. Thanks to Mick and Peter for having me on the show. I really appreciate the invitation. Here is the audio of the interview. There are two clips that should play together as one. The Nashville Predators (22-14-3) hope to end their recent three game slide when they travel to St. Louis to play the Blues (17-16-5) at the Scottrade Center. The Predators played somewhat better in the 5-4 loss to Chicago on Sunday night with a two goal rally to tie the game late. However, a leaky defense and a Hawks team that takes advantage of every mistake doomed the Pred's comeback chances. The Blues have lost their last two games including a 5-3 setback to Buffalo at home on Sunday. St. Louis has played well on the road going 11-4-3, but have been miserable at home with a 6-12-2 record. The two teams have met twice this year with each team winning 3-1 on the opponent's home ice. The last meeting was on November 27, in Nashville when the Preds debuted their third jersey. Both teams have injures to key players with Jordin Tootoo (foot) and Jerred Smithson (hand) out for the Predators. The Blues will be missing Paul Kariya and D. J. King. According to John Glennon, Pekka Rinne (14-7-2, 2.80, .905) will start for the Predators while ex-Pred Chris Mason (11-11-4, 2.54, .910) will be in goal for the Blues. Mason has had great success against the Preds going 3-1-2 in his career. The Predators need to leave the last three games behind and return to playing the hockey that they were playing a couple of weeks ago. The Predators need to improve their play against top teams like Chicago, but when the best team in the league plays "the perfect road game" as Chicago did on Saturday, you probably will lose. Likewise, a half-hearted effort in Vancouver led to the loss there against the Canucks who played one of their better games of the year. The key tonight is to return to playing Barry Trotz-style Predator hockey with a "Band of Brothers" mentality and put in a full sixty minute team effort. This is a lot easier said than done. The Preds have given up three or more goals a game for their last nine games. When you are scoring five or more goals the GAA does not appear relevant, but when you return to your average 2.8 goals scored per game, it will leave you in a hole on a regular basis. The increased tempo of recent games and sloppy puck handling in the defensive and neutral zones has lead to far too much pressure being put on Predator goaltenders. While it has contributed to an increase in Predator scoring, the loose play has had its consequences. What the Predators do not need to do is to get so overwhelmed with "puck management" that they forget how to shoot the puck. This has happened in the past and the result has not been good. You can still shoot the puck 35-40 times in a game without having one of your defenseman on the rush on every play. The Predators penalty kill unit has given up goals in 13 of their last 14 games and are currently 28th (75.8%) in the league. The Blues power play is 25th (15.7) so this would be a good game to be perfect on the PK. The Predators power play has been even more dismal being ranked 29th (15.5%) in the NHL. 29 of the Predators last 30 goals have come at even strength and they have not had a power play goal since December 17, in Edmonton. The Blues have an excellent penalty kill (4th, 86.2) so the Preds will have to improve against one of the best PK units. The Predators finish their brief three game road trip with a game Thursday night in Columbus before returning home to play Anaheim on Saturday. Dave Scatchard has officially cleared waivers and will report to the Milwaukee Admirals. His assignment leaves the Predators with twenty players dressing for tonight's match with the Blues. It is probable that another player or two will be recalled before Thursday's game in Columbus. Nashville, Tenn. (December 29, 2009) – Nashville Predators President of Hockey Operations/General Manager David Poile announced today that forward Dave Scatchard (DAYV SKAT-chuhrd) has been reassigned to Milwaukee (AHL). Scatchard, 33 (2/20/76), has posted five points (3g-2a) in 16 games with Nashville this season. He played in his first NHL game since Jan. 27, 2007 on Oct. 21 at Boston, and posted his first NHL point since Jan. 7, 2007 at Ottawa the next night. The Predators face the St. Louis Blues tonight at Scottrade Center (FOX Sports Tennessee, 104.5 The Zone, 6 p.m. CT.). After a tilt at Columbus on Thursday night, the Predators return to Nashville for a four-game homestand beginning with the Anaheim Ducks on Saturday night. Tickets to this game, and all other regular season contests are on sale and can be purchased by logging onto nashvillepredators.com. Tickets are also available by calling (615) 770-PUCK and at all Ticketmaster locations. Programming Note: I will appear on NHL Home Ice XM 204 this morning on The War Room with Mick Kern and Peter Berce in a segment during the second half hour of the show after 10:40 a.m. CST. The topic will be blogging which is pretty wide open, so we will see what my first appearance on national radio will bring. Last night's POTG Radio special Winter Classic Edition was an enjoyable show to do. I spent the entire hour talking to Inside Hockey's Tim Rosenthal about the upcoming game and all the events surrounding the NHL's biggest annual event (outside of the playoffs). We covered all angles of the Winter Classic from the teams participating, to the potential weather, and all the logistics and planning that have gone into making the game happen. John Glennon reported at Inside Predators that there will not be a call-up for tonight's game as Wade Belak will start against the Physical St Louis Blues. He also has a story about the dreadful Predator special teams and a game at a glance for tonight's match between the Preds and Blues. Jim Diamond urges the Preds to close out 2009 with a pair of wins at The Examiner. Hockey's Future has a mid-season update on Predator prospects. An injury free Colin Wilson would be a nice shot in the arm to the Preds right now. Anyone have a magic wand? The Milwaukee Admirals rolled over Grand Rapids 5-2 lat night. Short Shifts has the story. Forechecker is taking a poll of the biggest Pred's story of the year. I voted Sully for Masterton but I'm biased because I was there to see it. Steve Sullivan was on NHL Live yesterday. Sully discussed growing up playing outdoors, the Pred's team make-up, his recovery from back surgery, playing for Barry Trotz, Brent Peterson and his best Christmas present. The Predators have a special going for Saturday's home game with the Ducks. The first 100 people to go here and purchase tickets and enter the special offer code TOOTOO will get an invitation to a special meet and greet with Jordin, himself before the game. The Wade's World video featuring Wade Belak and various Preds is now up on the Preds site. I'm surprised more folks didn't complain about the the part about eating dogs. Eric LaForge questions the Pred's defense at Bleacher Report. Preds101 is looking for a few questions to explain to new hockey fans. If you ever had something that you weren't clear about, now is the time to ask. Monday was a slow day at the tournament with only two games. Canada (wearing their green third jersey) beat Switzerland 6-0 while Russia beat Finland 2-0. The Predator prospect page is updated with yesterday's results. Puck the Media has a positive review of the NHL Network coverage. The Hockey Zen has a new World Junior page with videos. Sweden vs. Russia 5 p.m.
Canada vs. Slovakia 7 p.m. In a Monday announcement, the NHL said the The Dropkick Murphys will play and Daniel Powter and James Taylor would perform the anthems at the Winter Classic. The Murphys are a solid addition to the Boston event. In a bit of over kill, the NHL set up a James Taylor microsite. I'm sorry that I'm not a James Taylor fan. It seems to me that the NHL could get bigger named entertainment to draw in non-fans. Where did they dig up Chaka Khan at last year's award show? James Murphy writes on the weather for the Winter Classic at NESN. Puck the Media has a ratings prediction for this year's event. He also has NBC's final Press Release with facts about the game. Icethetics speculates on next year's venue and teams. It doesn't get any better than Puck Daddy's Best stories of 2009. In a trade on Monday the Caps sent Captain Chris Clark and Milan Jurcina to Columbus in exchange for Jason Chimera. The biggest issue that remains is who will be the Washington Captain. Few seem to think Ovechkin is the man for the job. Michelle Kenneth's in depth article about the misunderstood goon, George Laraque is now up at Inside Hockey. It's a great story that covers many aspects of Laraque's career on and off the ice. Interesting Tweet from @BlueJacketsBuzz: "In a small media scrum with Scott Howson who was asked when the last time he talked to Filatov, he said "When he left." I guess he left on as good a terms as Radulov did. After a week off #SaturdayNHLPicks is back. Al Cimaglia has an excellent piece on blogging and accountability at Hockey Independent. Michael Langlois has a look at how the Leafs may evolve in the next few years. Bruce Hollingdrake starts a three part series on the situation in Columbus. Our friend Russ Cohen has a nice piece on John Tavares at Sportsology. Randy Workman interviews the Yotes Diva, Heather McWhorter. Vince Vaughn dropped the puck at the Preds-Hawks game on Sunday and FS TN did not show it. Vaughn was in one of the greatest "Hockey" scenes in a movie in the Jon Favreau classic from 1996, Swingers, that featured a fight over a video game with the Blackhawks and Kings as participants. Here is the scene (caution R-rated). On the Twitter front... The Top 10 Most Important Tweets of 2009. The Nashville Predators sent Alexander Sulzer back to Milwaukee. It is unclear if it is just for tonight's game or if it will be a longer stay. In my opinion, in the competition for the sixth D-man slot, it is not even close. Cody Franson brings far more to the table offensively and has surprised everyone with how few major rookie mistakes he has made on defense. Nashville, Tenn. (December 28, 2009) – Nashville Predators President of Hockey Operations/General Manager David Poile announced today that the club has reassigned defenseman Alexander Sulzer (al-ehx-AN-duhr SUHLT-suhr) to Milwaukee (AHL). Sulzer, 25 (5/30/84), has one assist in 10 games with the Predators this season, posting his first career point/assist on Oct. 22 at Ottawa, while averaging 13:10 of ice time and notching a plus-three rating. The Predators face the St. Louis Blues tomorrow night at Scottrade Center (FOX Sports Tennessee, 104.5 The Zone, 6 p.m. CT.). After a tilt at Columbus on Thursday night, the Predators return to Nashville for a four-game homestand beginning with the Anaheim Ducks on Saturday night. Tickets to this game, and all other regular season contests are on sale and can be purchased by logging onto nashvillepredators.com. Tickets are also available by calling (615) 770-PUCK and at all Ticketmaster locations. Tonight's edition of POTG Radio will primarily focus on Friday's Winter Classic at Fenway Park that will pit the Philadelphia Flyers against the home town Boston Bruins. Our special guest will be Tim Rosenthal who will be reporting in from the Boston area. Tim is one of the editors of Inside Hockey as well as the primary contributor at Rosie's Hockey. In addition to the Winter Classic, Tim has his pulse on the heartbeat of College Hockey and the Bruins. I'm sure we will also cover the Predator's recent games and the World Junior Tournament that is under way. I'm looking forward to the show. We hope you will join us. Here is our story from last night. John Glennon has the game story at the Tennessean and his notes column that includes the possibility that Dave Scatchard may be waived since the holiday roster freeze has expired. David Boclair has a brief piece at The City Paper. In Pred Blog World Forechecker, See Puck City, Mark Willoughby, Jennifer the Preds Addict, and Fan Huddle have stories. For the Chicago side of the story visit the Chicago Tribune, Sun Times, or Daily Herald. As we noted yesterday, Patric Hornqvist made the Olympic team for Sweden. FaceOff has an Edmonton Journal piece on Barry Trotz. It's well worth the read. Team USA fared well in a 3-0 win over Switzerland on Sunday afternoon to bring them to 2-0 in the tournament. Tuesday will be a big day at the tourney with the US and Canada in action. The game everyone is waiting for will be the USA-Canada game on New Year's Eve. Jim Diamaond wraps up all four games from Sunday. Ryan at the RLD has the strangest goal of the year. Matt at View from My Seats defines depth and why it is important. The Chicago Blackhawks showed the hockey world why they are the best team in hockey at his time with a comeback 5-4 win over the Nashville Predators. Behind 2-1 at the end of two period, the Hawks rallied for four goals in the final period to overwhelm their closest division rival. With the score tied, 4-4 and 43 seconds left in the game, Patrick Kane buried the game winner to give the Hawks the win, the sweep of the home and home, and an eight point lead over Nashville in the Central Division. Patrick Kane had a three point night with two goals and an assist. John Madden had two goals and Brian Campbell added a goal and an assist. Jonathan Toews had three assists. The Predators were led in scoring by Cody Franson with a goal and an assist while Dan Hamhuis, Marty Erat and Marcel Goc each had goals. Antti Niemi improved his record as a rookie to 9-1-1 while stopping 16 of 20 Predator shots. Dan Ellis stopped 24 of 29 Blackhawk shots in the loss. The Predators got on the board early at 1:35 in the first when Cody Franson fired a shot from the blue line that was tipped by Marcel Goc and found its way through Antti Niemi's five hole to give the Preds an early 1-0 lead. At 4:40 Marty Erat was called for interference and the Preds successfully killed the Hawk man advantage. Unfortunately, shortly after time expired on the power play, the Predators left Patrick Kane unguarded to the right of Dan Ellis and he flipped a loose puck into the net to tie the game 1-1. Wade Belak was called for charging and after about 30 seconds of delayed penalty man advantage, the Hawks officially went on the power play again at 11:16. Chicago got two shots on goal but were unable to convert. The Predators got bonus power play time on a delay when Brent Sopel was called for slashing at 17:04. Predators struggled for possession and only got one shot, one from Franson at the blue line. The period ended tied 1-1. The Predators appeared to have more jump than in last night's game but still appeared over matched by the Hawks. Both teams were credited with six shots. The Predators started the second period quickly with a goal by Marty Erat 47 seconds in. The play started when Steve Sullivan was left open in the slot and Niemi challenged him but let a rebound loose that Erat was able to put in the open side of the net. Leaving two players unfronted is very atypical of this Blackhawk team. In the next six minutes of play, the Hawks had a barrage of five great scoring chances but were stymied by a pipe and a four Dan Ellis saves. The Predators had their second power play opportunity at 13:20 when Brent Seabrook was called for holding. The Predators never got a shot and were victimized by three Chicago takeaways to make for a very ugly man advantage for the Preds. The Preds survived the final minutes of the period to maintain their 2-1 lead. The Hawks out shot the Preds 9-6 for the period. The third period was probably one of the most important 20 minutes of the season thus far. Win or lose, the Predators would need to find out what type of team they wanted to become for the second half of the season. Patrick Hornqvist was whistled for holding at 4:23. The Hawks got two shots but the Predators actually had the better scoring chance short-handed on a Sullivan to Legwand odd man breakaway that Niemi was able to stop. The Predators had another great scoring chance shortly after the penalty kill but with four men on the rush they left John Madden wide open for an outlet pass that he took the length of the ice and deeked Ellis out of position to open up the net for an easy goal at 6:40. Steve Sullivan put the Preds a man down again at 9:38 when he inadvertently caught Brent Seabrook in the face with his stick. The Preds held the Hawks shotless on the penalty kill. In what appeared like deja vu from minutes earlier, the John Madden again scored at 12:12 on an outlet pass breakaway. The difference the second time was that Ryan Suter was able to deflect the puck to help tip it past Dan Ellis for the score to make it 3-2. At 13:15 things spiraled further out of control when Dan Hamhuis tripped John Madden. Twelve seconds into the Hawk man advantage Brian Campbell let loose with a shot from the blue line that Dan Ellis never saw due to a complete screen by Troy Brower that Ryan Suter did nothing to prevent. I'm sure the 4-2 advantage was called "game, set, match" by Barry Trotz at the time. The Predators were not finished and pulled within one when Dan Hamhuis nailed a shot from the blue line and Niemi was fully screened by Joel Ward to bring the Preds back with in a goal. Even more surprising, fifty-seven seconds later, Cody Fransen fired a shot from the blue line that made its way through traffic to tie the game 4-4. The Blackhawks did what they do best at 43 seconds left when they threw things into complete disarray around the Predator net and Patrick Kane picked up his own rebound and placed it in the net to seal the 5-4 Blackhawk win and the sweep of the two game series. For the final period, the Blackhawks out shot the Preds 14-8 and controlled the tempo of play. By stopping the Predators on an off night on Saturday and then again when the Preds gave a much better effort on Sunday, the Hawks clearly established themselves as the most complete team in hockey. They have a multitude of weapons on offense, the league's best goals against average on defense, and a highly underrated goal-tending duo. After being berated by Barry Trotz for not being up for Saturday's game, the Preds played much better on the road and staged an unbelievable comeback to tie the Hawks after falling behind late. While they did not get a point out of Sunday's game, they did learn a little more about what they are capable of being. The two late goals will be something that they can point to later in the year as the reason to never give up in a game against lesser opponents. The back and forth nature of the game was truly spectacular and will qualify for one of NHL Home Ice's "Games Gone Wild". The Hawks and Preds each scored two quick goals in the final eight minutes before Kane's game winner. Although it wasn't the outcome Pred's fans wanted, it was thrill-a-minute hockey. The Predators head to St Louis where the Blues have strugged in home games, for a Tuesday night game before traveling on to Columbus for a New Year's Eve to end the three game road trip. The Predators have their back against the wall tonight in Chicago. Our Game Preview from yesterday still stands except for the emphasis on the key to the game that says they have to win one of the two games in regulation leaving tonight's game as that game. Mark at the View from 111 vented his frustration over Saturday's loss at Hockey Independent. As he says, the top players were not the top players. The only reason Jason Arnott was not invisible was for the memorable bumbles that he made with chances to put the puck on net. I'm not sure what Barry Trotz will do to lite a fire under the team but if he can't get their attention today to encourage them to play a full sixty minutes, then the team is incapable of having their attention gotten. Here is our story with post game videos from last night. Bryan Mullen has the game story at the Tennessean and his notes column. Jim Diamond has his thoughts on the game at The Examiner. He also has a World Junior story. In Pred Blog World Brandon Felder, See Puck City, and Fan Huddle have stories. Sweden announced their Olympic roster and it includes Predator Patric Hornqvist. He is the first of several Predators to be named to their country's team (unless you consider Radulov to still be a Pred). Wednesday should be a big day for Pred players with Canada, Finland, Czech Republic and Germany announcing their rosters. The Milwaukee Admirals also lost last night, 4-2 to Rockford. The first day of the tournament was full of excitement with Canada blowing out Latvia 16-0 and with Team USA mounting a big comeback 7-3 victory over Slovakia. Probably the biggest surprise of day one was Preds prospect Gabriel Bourque having three goals and four assists in Canada's big win. He received Puck Daddy's first star of the day award for his efforts. Bourque was one of the lower picks that stuck on Canada's squad. The Predator's site is keeping a daily log of the five prospects efforts. Today's US TV schedule on the NHL Network is as follows (all times CST). USA vs Switzerland 3 p.m.
Czech Republic vs Finland 5 p.m. The Nashville Predators returned from the Christmas holiday and played much like they did in the last game before the break as they lost to the Chicago Blackhawks 4-1 in front of a sell-out Sommet Center crowd on Saturday night. The Predators did not appear to be fully engaged while the Blackhawks took advantage of several Predator miscues. "It was an important game for us," said Chicago coach Joel Quenneville. "We responded to the game, played a perfect road game doing a lot of things right." Chicago got goals from Dustin Byfuglien, Patrick Kane, Andrew Ladd and Patric Sharp while the Preds lone goal came from Marty Erat. Chicago blistered the Predator nets firing 40 shots at Pekka Rinne who played well but had little support around the net as Predator miscues led to each Hawk goal. Jason Arnott said, "Pekka kept us in it. He made some great saves." Cristobal Huet had far less work in route to his 17th victory as the Predators only put 26 shots on net, and few were quality shots. The Predators only had one shot on goal midway through the first period leading Barry Trotz to say, "We came out fine but we didn’t want to shoot the puck for some reason and we ended up on the downside of a lopsided shot chart." After Chicago Coach Joel Quenneville called the Hawks effort "the perfect road game" he went further describing what he meant, ""It was an important game for us and we responded. We did a lot of things right. I thought we got to the net well. I thought we moved the puck well. Every line was contributing. We were good in all areas." "They are a good hockey team, I take nothing away from them," said Barry Trotz. "We can be harder, we can be better and if we don't believe it then our expectations as a group are way too low." Coach Barry Trotz was very upset after the game with the Pred's lack of urgency given the circumstances with the Preds trailing the Hawks by four points and having back to back games. "That was the number one thing I said, that it had to be a bigger deal. More urgency. More fire in the belly. It’s just not another game against Chicago, it’s not one of 82 – you are battling for something. If we’re not battling, then our expectations of ourselves are too low. We just need to respond tomorrow." The win extended the Blackhawks lead over the Predators to six points in the Central Division race and Sunday's match is the last regular season game between the two teams. When asked about the importance of the last game Joel Quenneville said, "It is unusual that we are going to play our last game with them. This one is also important for everyone involved and we have to respond in kind. I'm not worried about statements, I'm worried about playing well." Shea Weber was clear that he Blackhawks are not the only team fighting for the top spot saying, "Well, there are a lot of good teams. As you can see from the standings it’s tight the whole way through. They are a good team, but there are a lot of good teams." The Preds and Hawks go back at it at the United Center at 6 p.m. Sunday. No one has expectations that it will necessarily be the same type game. Chicago Goalie Cristobal Huet summed up the Chicago view saying, "When you play back-to-back games winning the first one is always nice. I think we can expect a little more from Nashville when we play them again." Barry Trotz expects more on Sunday in Chicago, "We are going to correct what we didn’t do today and we are going to go into Chicago with what I hope will be our best effort." Trotz further explained, "I’m OK if your best effort isn’t good enough. That’s part of the game, part of sports. But we need more people sacrificing a little bit more. We need everybody all in and tonight we had some guys who weren’t quite all in." Shea Weber was emphatic, "There are no excuses. We’ve got to be ready to go and we’ve got to be better." The Nashville Predators (22-12-3) will play the Chicago Blackhawks (24-9-3) in a two day, home and away series that begins tonight in a Music City Bowl packed downtown, and ends tomorrow night at the United Center in Chicago. This update will serve as a preview for both games. Surprisingly, these games have become a battle for the top of the Central Division and are the last two times the teams will meet during the regular season this year. Chicago is in first place in the Western Conference with 51 points and have a game in hand on the Preds who have 47 points and are in a tie for fifth in the West and are second in the Central. The teams have met four times this year, each winning two games. On October 15, the Preds played a miserable game in which they only had 13 shots and lost to the Hawks 3-1. Nine days later the Preds were shut out by the Hawks in Chicago 2-0. On October 29, Pekka Rinne shut out the Hawks 2-0 to give the Preds a home win in what I called the team's best effort of the season at the time. On December 4, the Preds won a huge road game in Chicago winning 4-1. Both teams are having successful runs with the Preds going 14-4-2 in their last twenty and the Hawks going 15-4-1 in their last twenty. The Preds suffered a disappointing 4-1 loss at Vancouver on Tuesday in their last game out while the Hawks shut out the Wings 3-0 in Detroit on Wednesday. In Tuesday's game the Predators lost Jerred Smithson for what may be a month with a hand injury when he blocked a shot on his second shift of the game on a penalty kill. The Preds are already without Jordin Tootoo who is recovering from a broken foot. Andreas Thuresson has been recalled to Take Smithson's place on the roster. This is Thuresson's third recall of the year having played ten games with the Preds with two assists in earlier stints. Pekka Rinne (14-6-2, 2.75, .905) will start for the Preds tonight meaning Dan Ellis (8-6-1, 2.76, .909) most likely will start on Sunday. It is unclear whether Christobal Huet (16-8-2, 2.05, .913) or Antti Niemi (8-1-1, 1.59, .937 with four shutouts) will start tonight. Chicago has a bevy of scorers led by Patric Kane (12 goals, 26 assists), Duncan Keith (6,25), Patric Sharp (11,16) , Jonathan Toews (11,13), Kris Versteeg (10,10) and Dustin Byfuglien (10,3). The Hawks also have league's stingiest defense allowing only 2.0 goals per game. With these games being the last two meetings of the year, the Preds do not want to lose ground to the Hawks who are four points ahead with a game in hand. A regulation win would insure that they would not lose any ground to the Hawks in this two game set. Any more than that would be considered outstanding as it would guarantee that he Preds would make up territory on the Hawks in their last meetings of the year. The Predators need to not skip a beat with Thuresson replacing Smithson. When Jordin Tootoo went out, Nick Spalling filled in doing what he was asked to do in keeping the Barry Trotz system in tact. This will be Andreas Thuresson's chance to do the same thing. Smithson's shoes will be hard to fill as he has become a vital cog in the system this year since moving up to the second line. The Predators special teams have been horrible this year with little sign of building any consistency on the power play (16.1%, 25th) or penalty kill (75.8%, 28th). This is the area where the team has the potential for the greatest upside in the second half of the season. Chicago is ranked second (87.0%) on the penalty kill and 14th (18.8) on the man advantage. After the weekend series with the Hawks, the Preds will face divisional rivals St. Louis and Columbus on the road this week before returning home to play an improving Anaheim Ducks team at home next Saturday. This five game in eight nights stretch will tell much where the Preds are headed in the new year. As was reported last night by Admirals Short Shifts Andreas Thuresson will report to Nashville for tonight's game. The Tennessean also confirmed the move today. With the loss of Jerred Smithson for up to a month and Jordin Tootoo alread on the injuered reserve list, the Predators are testing their depth in the orginization. Nashville, Tenn. (December 26, 2009) – Nashville Predators President of Hockey Operations/General Manager David Poile announced today that the club has recalled forward Andreas Thuresson (an-DRAY-uhs THUHR-eh-suhn) from Milwaukee (AHL). Thuresson, 21 (11/18/87), has two assists in 10 games for Nashville in 2009-10, his rookie NHL season. Additionally, the Kristianstad, Sweden native has 13 points (6g-7a) in 20 games for the Admirals. This is the third recall this season for Nashville's seventh choice, 144th overall (fifth round), in the 2007 Entry Draft. The Predators play their final home game of 2009 tonight when they host the Western Conference-leading Chicago Blackhawks in the first game of a home-and-home set (7 p.m.). Tickets to this game, and all other regular season contests are on sale and can be purchased by logging onto nashvillepredators.com. Tickets are also available by calling (615) 770-PUCK and at all Ticketmaster locations. Happy Boxing Day (Breakfast) and Round-Up! Over the past ten year's, due to logistics, our traditional Christmas breakfast that we have had since I was a toddler, has gotten moved to Boxing Day. This year, in honor of our Canadian friends and hockey traditions, we finally officially recognized the move, which seems to be permanent, by renaming the event the Official Boxing Day Breakfast. 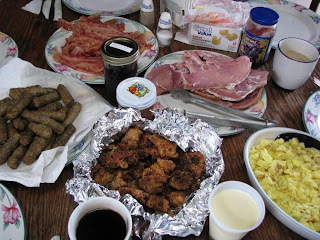 The meal consists of fried oysters, country ham, sausage, bacon, eggs, biscuits with massive amounts of butter and eggnog. Basically, nothing involved is good for you and adds about 50 points to a normal person's cholesterol reading. If anyone is interested, we will issue a standing invitation to the meal next year on Boxing Day. Just let us know in advance. Admirals Short Shifts was the first to report that Andreas Thuresson will report to Nashville for tonight's game. The Tennessean confirmed the move today. Short Shifts also has a few story gems including a Cody Franson feature from Kelowna and a Pickard brothers story from Su Ring. Steve Sullivan's come back makes Puck Daddy's top ten feel good stories of the decade. John Glennon had a feature on Christmas day about the NHL taking notice of the Pred's offense. Bryan Mullen has today's story about the Central Division race. They also have the Game at a Glance for tonight's game. AJ Celebrates Christmas with a good story about fights. Paul McCann talks about tonight's game at Hockey Buzz. Mark Willoughby's My View is a special fone for Christmas. See Puck City has his Christmas wishes too. The Chicago Sun Times has a look at tonight's match-up. Tim Sassone also has a look from the Chicago perspective. The Globe and Mail has a story about the Preds and their defensive development. As always, from Toronto, the story closes with a negative. Also they have another story resurrecting old news to talk about trouble in Nashville. Today is the official start of the World Junior Championships from Saskatchewan. The NHL Network will carry three games today. Latvia vs. Canada 4 p.m.
Czech Republic vs. Sweden 6 p.m.
Slovakia vs. USA 8 p.m.
Puck Daddy Has the top ten storylines to watch during the tournament. Team Russia announced their squad for the Olympics. Mirtle has the story with some projected lines that appear to be outstanding. Dmitry Chesnokov at Puck Daddy has a more in depth look with some different pairing and a ton of analysis. Matt answers a tough question at View From My Seats; why he writes. Chris at The Program offers Christmas Wishes with a virtual Yule Log. For everyone needing to get back in ths wing quickly today, Ryan at the RLD has a preview of all of tonight's games. Pred's Prospects Look to World Junior Tournament.